Day five of the Homes for Heroes Twelve Days of Christmas took place in Modesto, CA. Homes for Heroes real estate specialist, Frank Orr, presented Mike Pearson and his family with $500 worth of gifts from Homes for Heroes. The Pearson family had the opportunity to make out their own Christmas wish list. They did, kind of, because they also used the opportunity to wish gifts for others in their community. Mike Pearson is a family man, husband, father of three and a man of faith! He is also one of our hero healthcare professionals. He is currently serving as the Senior Department Manager of Pediatrics at Sutter Gould Healthcare in Modesto, CA. He has been with Sutter for 8 years and truly loves what he does. In July of 2017, Mike was wrestling with his son when he was accidentally elbowed in the ribs. He didn’t think much about the minor injury, except that it resulted in a lot of pain, and it wasn’t going away. Mike was forced to seek medical attention. This minor mishap actually turned out to be a life changing and saving event, or a “blessing” as Mike calls it. It allowed the discovery of his Stage 4 adenocarcinoma bladder cancer. There is no cure for Mike’s cancer. It’s a rare form of cancer, and it has spread to his muscles. Doctors told him to prepare to be on chemo the rest of his life. “If cancer does decide to take me, and it’s God’s will that I pass, I want to make sure I leave this place better off,” said Pearson. “My story is one of faith and love, and battling cancer doesn’t always have to be a sad story. We have had many miracles and life changing moments while fighting cancer.” He has battled depression following his diagnosis and realized his perspective and mindset is everything. He realized he had to make a decision to be depressed, or use his circumstances as a tool for healing. 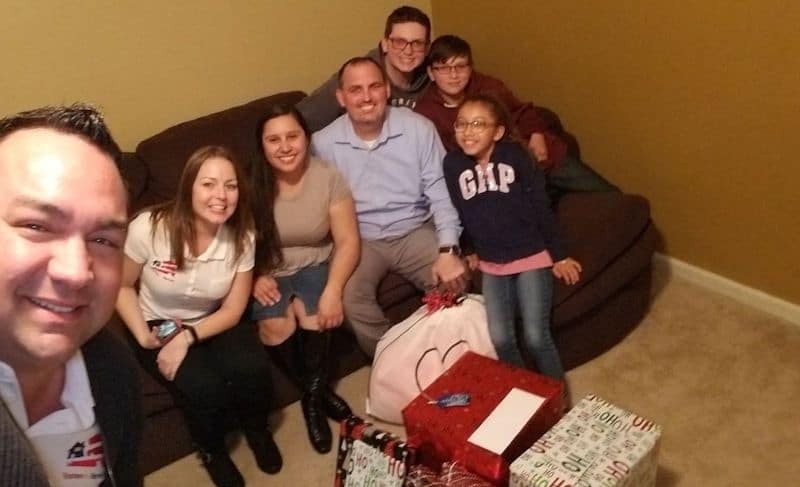 On Monday, December 3rd, the Pearson family received a $500 gift from Homes for Heroes and real estate specialist, Frank Orr, presented it to the family for their Twelve Days of Christmas Miracles. Using the $500 gift, Frank was able to purchase and deliver many Christmas gifts for Mike and his family. The Pearson family was given the opportunity to sit together and write down their wish list. Instead of solely focusing on their own wish list, they also chose to include gifts for other members of the community. The family really enjoyed that experience. Frank and his team were able to meet each of Mike’s family members to present the gifts. Thank you to all who made this Christmas gift possible. And Mike, we all thank you for your service. 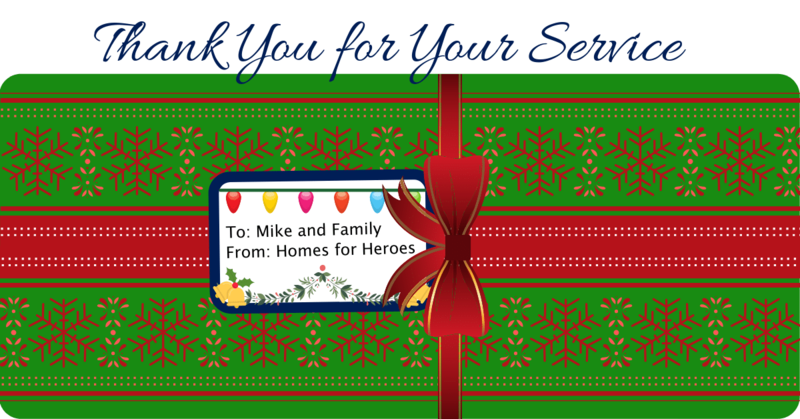 Happy Holidays and Merry Christmas to you and your family from all of us at Homes for Heroes.